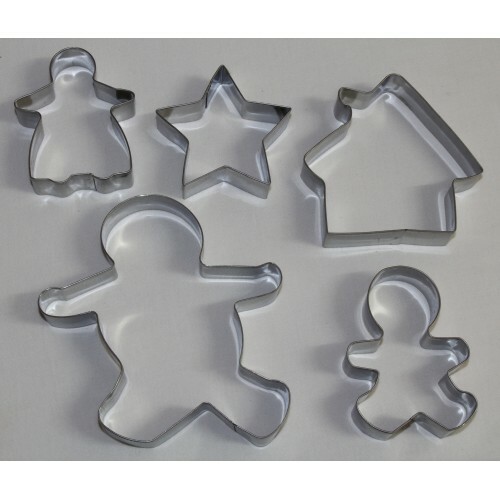 Use this gingerbread man 5 piece stainless steel cookie cutter set to make interesting lunch box sandwiches. Set includes a Gingerbread Man (11cm W x 12cm L), Gingerbread Lady (6cm W x 7.5cm L), Gingerbread Boy (5.5cm W x 8cm L), Gingerbread House (9cm W x 8.5cm L) and Star (7cm W x 7cm L). These cookie cutters are made from stainless steel and are rust resistant. Includes a basic cookie recipe to use with your cookie cutters. 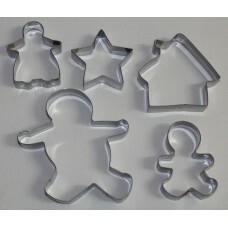 Also use the gingerbread man cookie cutters to cut fondant shapes to decorate cupcakes and birthday cakes. Perfect for celebrating the festive season. Bake delicious home made biscuits using this gingerbread boy mini cookie cutter and then decorate wi..
Bake delicious tiny home made biscuits using this teddy bear mini cookie cutter and then decorate wi..
Bake delicious home made biscuits using this spider mini cookie cutter and then decorate with icing ..
Bake delicious home made biscuits using this car mini cookie cutter and then decorate with icing for..
Bake delicious home made biscuits using this train mini cookie cutter and then decorate with icing f..
Bake delicious home made biscuits using this snowflake mini cookie cutter and then decorate with ici..
Use this 5 point star extra mini cookie/fondant cutter to decorate delicious home made biscuits and ..